Retirement Investing Today: Has the UK Already Had Its House Price Crash? Has the UK Already Had Its House Price Crash? Every month I run an analysis which looks at the Affordability and Value of UK Property. This analysis uses the Nationwide House Price Index which measures the price of a standard house priced in Pound Sterling (£’s). The UK for all its problems is compared to the rest of the World a very attractive place to live and unlike a lot of countries actually has a Rule of Law. It’s not perfect but as a person who has travelled the world for my work I ask where is. This means a lot of people want to migrate and live here. 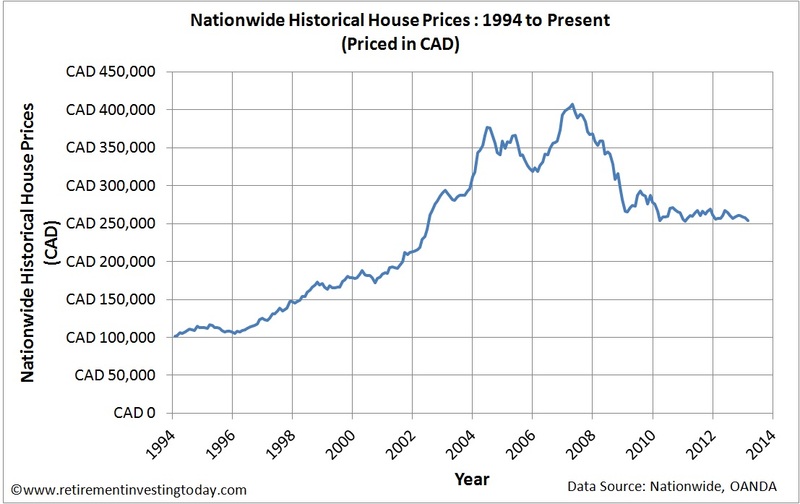 My first chart reminds us of the price of housing priced in Sterling. If you’re a UK resident earning in Sterling, saving in Sterling and investing in Sterling this is what you’ll see. 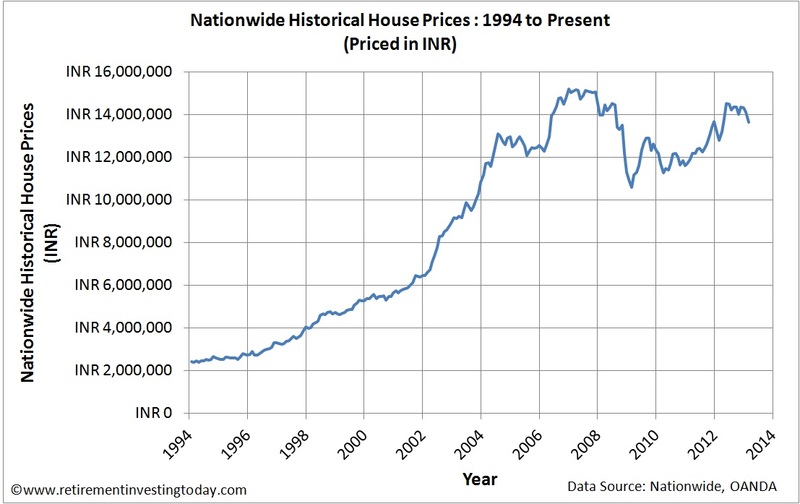 Since the peak prices in nominal terms have fallen 12.8%. 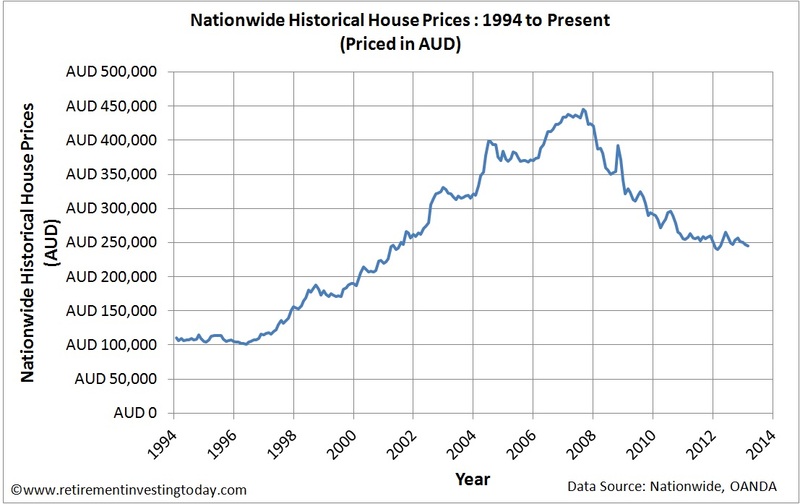 Hardly a House Price Crash, more a small adjustment. What about Prices measured in the most widely held Reserve Currency, the US Dollar? Measured in this currency we see UK house prices down 33.7%. What about Prices measured in the currency used by the Workshop of the World, The Chinese Yuan or Renminbi? Measured in this currency we see UK house prices down 44.3%. What about Prices measured in the currency used by the country that provides Back Office Services to the World, The Indian Rupee? Measured in this currency we only see a very small fall in UK house prices with them down only 10.4%. What about Prices measured in a currency used by a European country that still supports Manufacturing and runs a relatively prudent economy, The Swiss Franc? Measured in this currency we see UK house prices down 48.7%. What about Prices measured in a currency that might be considered a Commodity Currency, The Australian Dollar? Measured in this currency we see UK house prices down 45.1%. What about Prices measured in a second Commodity Currency, The Canadian Dollar? Measured in this currency we see UK house prices down 37.6%. Finally what about Prices measured in the oldest Currency of all, Ounces of Gold? Measured in this currency we see UK house prices down 78.4%. I’m now starting to wonder if the UK has already had its House Price Crash albeit one where the majority of the UK population has not been allowed to participate. What do you think? "You rent a house instead of buying it - you pay £". Only if you live in the UK and also only if the money being used for the rent comes from UK earnings and/or UK based investments. "You buy a house and rent it out instead of living in it - you get £". Agreed. 1. I'm a Swiss resident who has been earning and saving in Switzerland. I decide I'd like to buy a place in the English countryside. I'm a winner. 2. I'm a UK resident who's a gold bug. All my savings have been used to buy gold for many years. UK Houses just became a lot cheaper. - The pound is being devalued. I believe this is being done to support asset prices and also to help with UK competitiveness on the world stage. The problem with this method is that it only actually keeps UK assets high for the majority of UK based people while offshore residents have just seen everything getting a lot cheaper. It's also made everything overseas more expensive for us. Only the UK based person has been punished. - Had they gone the other way and allowed asset prices to deflate then it would have been a level playing field for all. Additionally UK competiveness could have gradually been helped by the ability to allow earnings to fall because we wouldn't have had to pay so much for the assets in the first place. 1. Why would someone Swiss want a house in the UK countryside when it rains most of the time? Maybe it's just me but having spent a significant portion of my life overseas for work I believe that the UK countryside is as beautiful as anywhere else on earth. It's one of many reasons I stay in the UK. 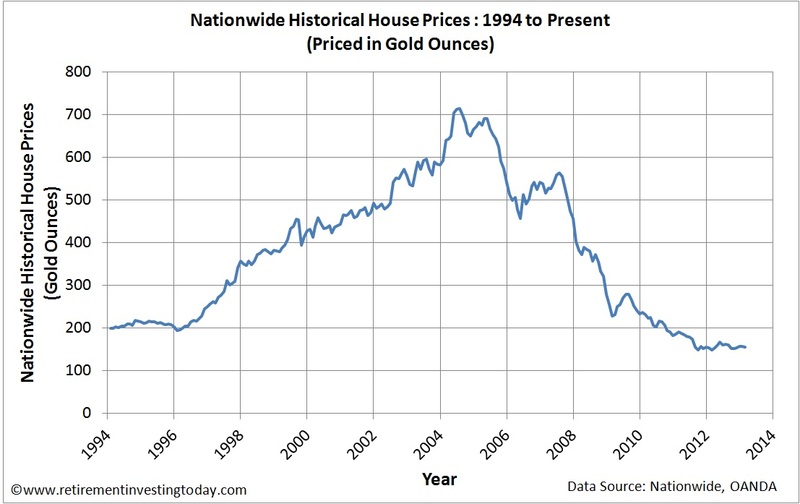 Looks like now would be a great time to be selling those gold bars and buying a house! I have always bought rather than rented - but for me its a roof over my head and something to leave to the children and grandchilden. I don't really think about the price rises or falls as its all relative. I'm with you on the house front. For me, when I finally buy, it will be a home for my family. Nothing more and nothing less. It will certainly not be included in my regular asset value calculation. Hmm. Very interesting charts as ever. But I would agree with your premise in some of your other posts that the key driver of residential house prices is the affordability of credit and not the strength of sterling. We also have very different residential property markets developing in the UK. The one place where foreign currency valuations might be relevant is where you have a very high percentage of foreign buyers - namely London. This, however, is where house prices have been most buoyant and I would be interested in seeing the results if the charts above were redrawn using a London House Price Index. I suspect the falls would be much less significant. In the rest of the UK where the vast majority of buyers are resident and earn their keep in £ I suspect it is cheap credit that is the key driver. Oddly enough, devaluation of the pound may force interest rates to rise sooner than expected, which should act to dampen house prices, unless wages start to rise faster than inflation. For that reason I would be very wary of ruling out further falls in real terms. Some interesting thoughts there. Thanks. Just to clarify I haven't changed my view on affordability where it is IMHO now simply all about interest rates. So I still agree with you on that one. One thing I don't think will happen for a long time is wages rising faster than inflation. I might be wrong but my thinking here is that we now live in a globalised world where UK wages are still very high in comparison. [Being] long housing ... the fundamental value of the house they own exceeds the present discounted value of their planned future consumption of housing services. There you are: I suppose for most families when the children leave home the parents become "long" housing, unless they sell and trade down. Perhaps they become "long" garden too. I think it makes more sense to think in terms of supply and demand, which is ultimately what determines prices in any market. A combination of increasing wealth in emerging markets plus a cheaper pound is obviously increasing DEMAND in a few areas of the UK. Factors like net immigration and increased life expectancy probably have a greater impact. But when rates eventually go up then there could be a massive and nationwide increase in SUPPLY if people can’t afford to pay their mortgages and become forced sellers. If lots of these people suddenly need to sell, then it will surely drive prices down unless new buyers come along to take up the slack. Has there ever been a time when rates were going up but wages were falling in real terms? If so that would be an interesting precedent to compare against. I wish it was just a matter of thinking in terms of supply and demand. 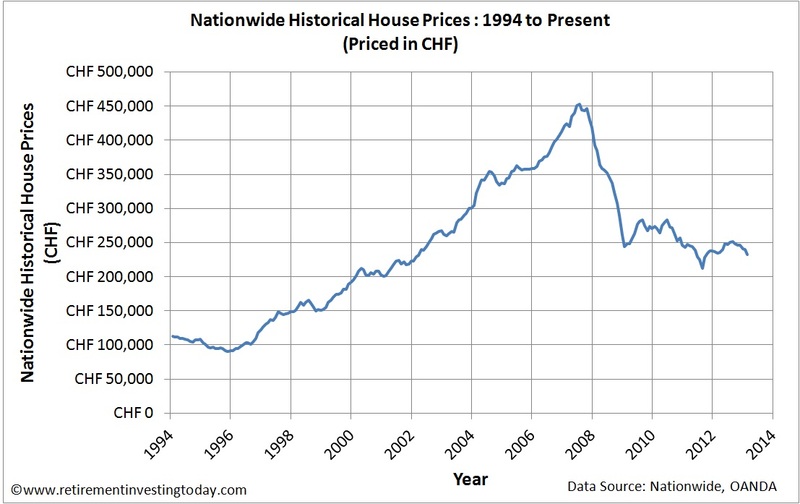 If it was then I suspect house prices would already be back to sensible levels when priced in £'s. Instead we get QE, Funding for Lending and Part Ownership schemes to name just 3 manipulating what is not even close to a free market. Charts are interesting, as always, but really show just how big a bubble Sterling was in 2007, and how big a bubble Gold, the Aussie, and the Loony are in today. You may be right. Sterling was clearly a mirage with everyone thinking the Financial Services, of which we were experts, was the biggest innovation since the wheel. Having spent some time in Australia recently the price of things there is ridiculous even after considering a crazy exchange rate. I'm not close enough to the Loony to comment. It would be great to have a look at the Big Mac Index to see what it suggests. Latest Big Mac Index was end Jan, and shows the Aussie overvalued by 12%, Loony by 25%, and Swiss franc overvalued by a whopping 63%. GBP was undervalued by 3%, suspect it's a bit more undervalued today. 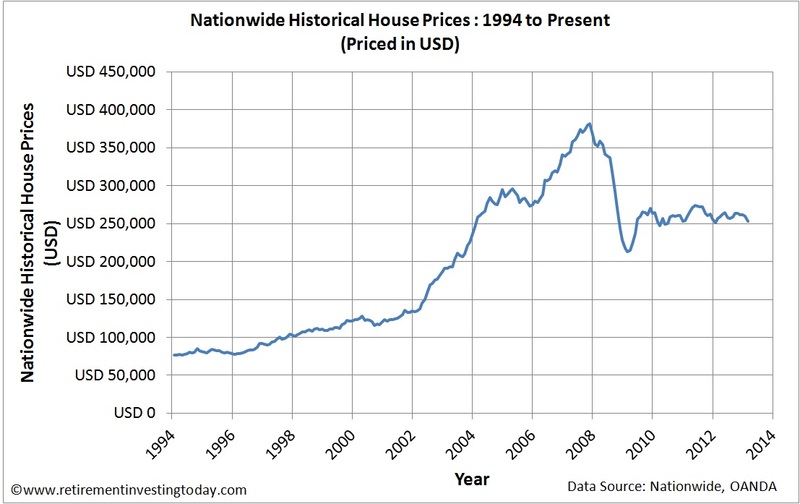 These charts are interesting but really tell you more about the bubble tendencies of currency than they do about house values. FWIW, I do think we've had our crash, but the reason why is less to do with currency and more to do with demographics, build rates, household formation and household size trends, etc. Did you get that online somewhere or did you get it out of the Economist? Thanks for the link A1. Hopefully other readers also find it of interest. Can I suggest you also post threads/links to your house price blog entries on the following debate boards, they'd be interested and would have no issues with you linking to here. I'm a member of HPC, an infrequent poster at Green Energy Investors (used to be fairly active) and mainly a lurker on 24K News these days. I'm not active on Money Saving Expert or Credit Crunch so may come across poorly. If you feel the content is relevant to those boards could you pop a link up on my behalf? You've been linked to occasionally by several folks there. But you'd be welcome to post regularly, and I'm sure would come across well if you did so yourself. I am a UK citizen living in China for the third time, this spell started Oct 2006. I get paid in US$ which I convert into CNY as soon as I receive it. Bought a house in the UK Jan 2007 on which I have a mortgage of about GB£45,000. It is rented out. 1. My CNY receipts have fallen as the US$ lost value against the CNY. 2. My CNY assets have gained in value against GB£. 3. 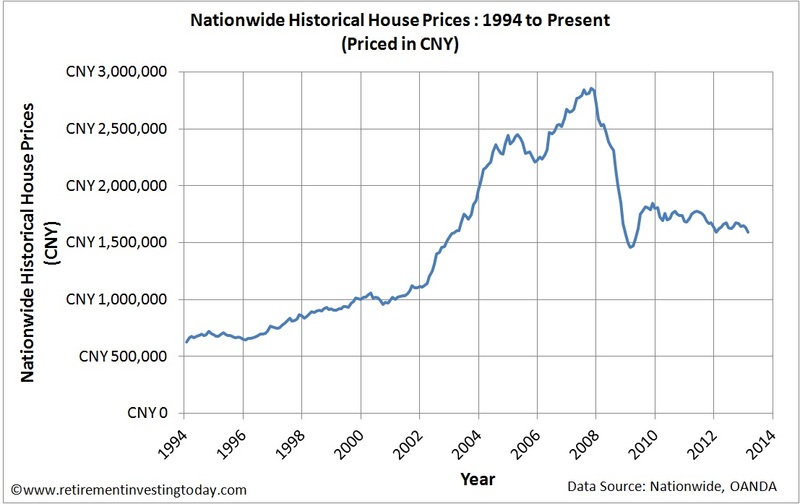 My mortgage has become much cheaper against US$ and CNY. 4. My UK house is about the same value as I bought it (it was a good deal). Am I better or worse off due to currency movement? Hard to say really! There is one part of the UK were house prices have crashed (and could still be crashing) Northern Ireland. 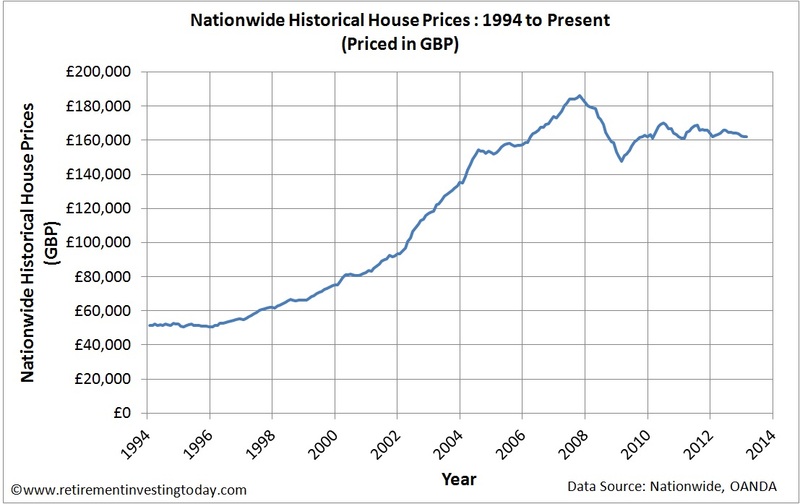 Their house prices have crashed to about half the 2007 peak as can be seen from this chart of historic average house prices in England and Northern Ireland. Its interesting to note as well that house prices in Wales have stagnated since 2006 as showed in this graph of historic average house prices in Wales and Northern Ireland.